"Calibre" redirects here. For any other use, see Calibre (disambiguation). Makers of early cartridge arms had to invent methods of naming cartridges since no established convention existed then. One of the early established cartridge arms was the Spencer repeating rifle, which Union forces used in the American Civil War. It was named based on the chamber dimensions, rather than the bore diameter, with the earliest cartridge called the "No. 56 cartridge", indicating a chamber diameter of .56 in; the bore diameter varied considerably, from .52 to .54 in. 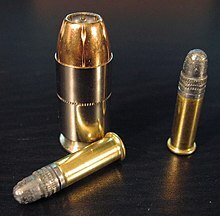 Later various derivatives were created using the same basic cartridge, but with smaller-diameter bullets; these were named by the cartridge diameter at the base and mouth. The original No. 56 became the .56-56, and the smaller versions, .56-52, .56-50, and .56-46. 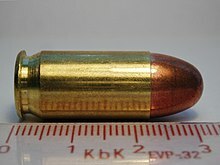 The .56-52, the most common of the new calibers, used a 50-cal bullet. Other black powder-era cartridges used naming schemes that appeared similar, but measured entirely different characteristics; .45-70, .44-40, and .32-20 were designated by bullet diameter in hundredths of an inch and standard black powder charge in grains. Optionally, the bullet weight in grains was designated, e.g. .45-70-405. This scheme was far more popular and was carried over after the advent of early smokeless powder cartridges such as the .30-30 Winchester and .22 Long. Later developments used terms to indicate relative power, such as .44 Special and .44 Magnum. Variations on these methods persist today, with new cartridges such as the .204 Ruger and .17 HMR (Hornady Magnum Rimfire). Metric diameters for small arms refer to cartridge dimensions and are expressed with an "×" between the bore diameter and the length of the cartridge case; for example, the 6.5×55mm Swedish cartridge has a bore diameter of 6.5 mm and a case length of 55 mm. The means of measuring a rifled bore varies, and may refer to the diameter of the lands or the grooves of the rifling. This is why the .303 British, named for the bird diameter across the lands, actually uses a .311-in bullet (7.70 mm vs. 7.90 mm), as bullet diameter matches the diameter across the grooves. Meanwhile, the .308 Winchester is measured across the grooves and uses a .308-in diameter (7.62-mm) bullet; the military-specification version is known as 7.62×51mm NATO, so called because the bore diameter measured between the lands is 7.62 mm, and the cartridge has a case 51 mm long. The following table lists some of the commonly used calibers where both metric and US customary are used as equivalents. Due to variations in naming conventions, and the whims of the cartridge manufacturers, bullet diameters can vary widely from the diameter implied by the name. For example, a difference of 0.045 in (1.15 mm) occurs between the smallest and largest of the several cartridges designated as ".38 caliber". .45 11.43 mm 0.451–0.454 in .45 ACP, .45 GAP, .454 Casull, .45 Long Colt, .455 Webley Bullet diameter depends on bullet type/material. Generally 0.451 in for full metal jacket bullets and 0.454 in for lead bullets. 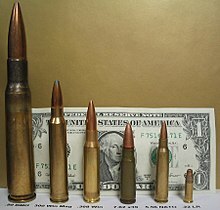 .50 12.7 mm 0.510 in, 12.95 mm .50 BMG, .50 Action Express, 12.7×108mm, .500 S&W Magnum M2 Browning machine gun and other heavy machine guns, long-range rifles typified by Barrett products. Desert Eagle handgun. Shotguns are classed according to gauge, a related expression. The gauge of a shotgun refers to how many lead spheres, each with a diameter equal to that of the bore, amount to one pound in weight. In the case of a 12-gauge shotgun, it would take 12 spheres the size of the shotgun's bore to equal a pound. A numerically larger gauge indicates a smaller barrel: a 20-gauge shotgun requires more spheres to equal a pound; therefore, its barrel is smaller than the 12-gauge. This metric is used in Russia as "caliber number": e.g., "shotgun of the 12 caliber." The 16th caliber is known as "lordly" (Russian: барский). While shotgun bores can be expressed in calibers (the .410 bore shotgun is in fact a caliber measure of .41 caliber [10.4 mm]), the nature of shotshells is such that the barrel diameter often varies significantly down the length of the shotgun barrel, with various levels of choke and backboring. The length of artillery barrels has often been described in terms of multiples of the bore diameter e.g. a 4-inch gun of 50 calibers would have a barrel 4 in × 50 = 200 in long. A 50 caliber 16 inch gun (16 inch diameter shell), has a barrel length (muzzle to breech) of 50 × 16 = 800 in (66 ft 8 in). Both 14-in and 16-in navy guns were common in World War II. The British Royal Navy insisted on 50-cal guns on ships as it would allow 1,900 to 2,700 lb (860 to 1,220 kg) shells to travel at an initial velocity of up to 1,800 mph (2,896 km/h) to a distance of 26 mi (42 km). Smoothbore cannon and carronade bores are designated by the weight in imperial pounds of spherical solid iron shot of diameter to fit the bore. Standard sizes are 6, 12, 18, 24, 32, and 42 pounds, with some 68-pound weapons, and other nonstandard weapons using the same scheme. See Carronade#Ordnance. From about the middle of the 17th century until the middle of the 19th century, measurement of the bore of large gunpowder weapons was usually expressed as the weight of its iron shot in pounds. Iron shot was used as the standard reference because iron was the most common material used for artillery ammunition during that period, and solid spherical shot the most common form encountered. Artillery was classified thereby into standard categories, with 3-pdr., 4-pdr., 6-pdr., 8-pdr., 9-pdr., 12-pdr., 18-pdr., 24-pdr., and 32-pdr. being the most common sizes encountered, although larger, smaller and intermediate sizes existed. In practice, though, significant variation occurred in the actual mass of the projectile for a given nominal shot weight. The country of manufacture is a significant consideration when determining bore diameters. For example, the French livre, until 1812, had a mass of 489.5 g whilst the contemporary English (avoirdupois) pound massed approximately 454 g. Thus, a French 32-pdr. at the Battle of Trafalgar threw a shot with 1.138 kg more mass than an English 32-pdr. Complicating matters further, muzzle-loaded weapons require a significant gap between the sides of the tube bore and the surface of the shot. This is necessary so the projectile may be inserted from the mouth to the base of the tube and seated securely adjacent the propellant charge with relative ease. The gap, called windage, increases the size of the bore with respect to the diameter of the shot somewhere between 10% and 20% depending upon the year the tube was cast and the foundry responsible. The relationship between bore diameter and projectile weight was severed following the widespread adoption of rifled weapons during the latter part of the 19th century. Guns continued to be classed by projectile weight into the mid-20th century, particularly in British service. However, this value no longer definitively related to bore diameter, since projectiles were no longer simple spheres—and in any case were more often hollow shells filled with explosives rather than solid iron shot. Barnes, Frank C. (2016). Woodard, W. Todd, ed. Cartridges of the world : a complete and illustrated reference for more than 1500 cartridges (15th ed.). Krause Publications. ISBN 1440246424. OCLC 934886116. ^ Barnes, Cartridges of the World 15 Edition 2016, p. 9. ^ Barnes, Frank C. (1997) . McPherson, M.L., ed. Cartridges of the World (8th ed.). DBI Books. pp. 8–12. ISBN 0-87349-178-5. ^ Barnes, Cartridges of the World 15 Edition 2016, p. 504. ^ Barnes, Cartridges of the World 15 Edition 2016, p. 670. ^ Accurate (2000). Accurate Smokeless Powders Loading Guide (Number Two (Revised) ed.). Prescott, AZ: Wolfe Publishing. p. 392. barcode 94794 00200. ^ "Pistol and Rifle Lead Bullets". ^ "LeadSafe Total Copper Jacket ("TCJ") Bullet List". Archived from the original on 1999-02-18. Retrieved 2007-12-05. ^ Frank C Barnes. Cartridges of the World (14th ed.). Gun Digest Books. ^ Barnes, Cartridges of the World 15 Edition 2016, p. 629.